Today I went with the Art Appreciation Group of the Faculty Women’s Group to the Museum of Anthropology to take part in a new guided tour the museum is offering called A Matter of Taste: Ceramics and Culinary Connections. One of the great benefactors of both the University of British Columbia and the museum itself was Walter C. Koerner and housed in the museum in its own gallery is Koerner’s personal collection of European ceramics which is a world-class collection of over 600 pieces made between 1500 and 1900. I will tell you more about this different tour at a later date but today I am just going to give you a teaser of what you will see there. A posset was a medicinal drink composed of hot milk, curdled with liquor and other ingredients, often spices. It also had a meringue-like froth on the top. It was used as a remedy for colds or other minor maladies. Often the patient was lying in bed and the mixture was partially spooned out and partially sucked from the spout. The word posset became a verb which had the meaning of pampering someone or making them comfortable. These pots were common wedding gifts and became family heirlooms. This particular pot is the size of a large teapot and the blue and white decoration imitates Chinese porcelain and shows the popularity of Eastern design at the time. 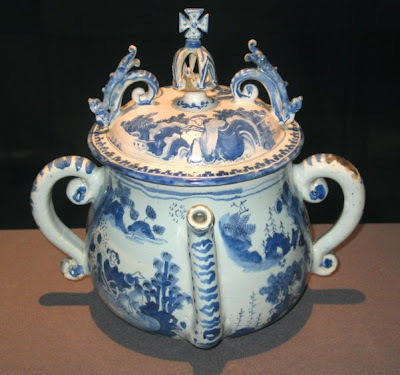 English delftware is tin-glazed pottery made in the British Isles between about 1550 and the late 1700s. The main centres of production were London, Bristol and Liverpool with smaller centres at Wincanton, Glasgow and Dublin.